Asexual reproduction, ie reproduction occurs without fertilization of egg by sperm, it is common in invertebrates. However, reproduction of how it can be very surprising if there in groups of vertebrate animals, or which often referred to vertebrates, although it does not mean nothing. Recently, researchers were surprised by the existence of snake species that reproduce asexually through a process called parthenogenesis. Boa Constrictor species is, or so-called boa, class no venomous snakes which have relatively large bodies and commonly found in the Caribbean, South America and Central America. The findings were started when Warren Booth, experts Population Genetics and Evolution of the Virginia State University, found a boa that gave birth to 22 puppies. Boa Boa found in Tennessee this Store are all females gave birth to puppies and characteristics are the same as its parent, caramel color. After conducting DNA tests on boa females and males found in the area, Booth was convinced that the boa had found reproduces in parthenogenesis. The reason, could not have produced puppies that have characters that are rarely, if not down the genes of both parents. Booth find something unique on this boa parthenogenesis. "Parthenogenesis is done when there are males in that place," said Booth. This, according to Booth, in contrast with parthenogenesis in general do not find a mate when mating. Until now, Booth had not found a reason parthenogenesis in snakes. Another uniqueness is the genetic material contained in puppies. In snakes, the male chicks will usually have a ZZ chromosome and female chicks have a ZW chromosome. However, this boa chicks child is different because the chromosomes are WW and male gender. "This is shocking. So far, scientists holds that seedlings with chromosome WW will not be developed," explains Booth. Booth said the boa ability in doing this parthenogenesis could have a negative impact. "They lose the amount of genetic diversity. 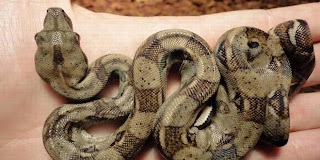 Boa it will tend to be physically and physiology which affects its ability to survive and reproduce," said Booth. Attention on how to reproduce it, according to Booth, is very important in snake conservation efforts. Booth research results published in the online journal Biology Letters on November 3, 2010.